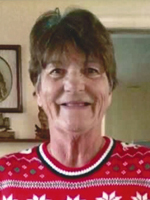 Jennifer "Jenny" VanArsdale Purdie, 66, died unexpectedly yet peacefully on Friday, January 4, 2019 in Newport News, VA. Jenny was born and raised in Newport News, graduating from Warwick High School as a member of the well known Grenadier Band and Bagpipe Corp. As a loving and supportive parent and advisor with Explorer Post 119 she inspired many adolescents over the years. In 2017 she retired after 43 years from the accounting office of 7-eleven. Jenny is survived by her daughter, Marie Sinnott; her son-in-law, Roy Sinnott; her grandchildren, Aly and Gary Sinnott and many other loving family members. She was preceded in death by her parents, Lee and Biddie VanArsdale; her beloved husband, Tommy Purdie and her brother, Bernard VanArsdale. A Memorial Service will be held at 2:00 pm on Sunday, January 13, 2019 at Weymouth Funeral Home with visitation to follow. Arrangements by Weymouth Funeral Home.